One of the highlights of a busy last weekend of October is the return of a beloved Columbus jazz tradition – Bungalow Jazz! Founder and proprietor Becky Ogden now owns a new property near Delaware – 5137 Riverside Dr, Delaware, OH 43015, six miles north of the Columbus Zoo – where she’ll be hosting a “Barn Jazz Party” on Sunday, October 28th from 3 to 5pm. The Dave DeWitt Trio – with DeWitt on piano, Derek DiCenzo on bass, and Aaron Scott on drums – will perform, which will be an excellent way to hear the newly refurbished “Bungalow piano” back in action. Be advised that the barn does not full service utilities yet, but this event, likely her only of 2018, will be a good peak at Ogden’s work in process, hopefully in advance of more shows next year. As always at Bungalow Jazz: bring a donation for the band, BYOB, and snacks will be available. Welcome back a dearly missed venue for world-class jazz in Columbus with one of its finest groups (thanks to Palmer Moore and his Famous Jazz Orchestra newsletter for the details)! Keep reading for previews of E-Flat, a tribute to Hamiet Bluiett, and Halloween Jazz! Saturday, October 27th (9pm – midnight): E-Flat featuring guest vocalist Najoura at The Savoy Club, East Side. An ensemble that blends elements of smooth jazz, gospel and soul into a satisfying whole, E-Flat’s resume is on the rise, including a new monthly Jazz & Mimosas Brunch at Aerial Wine Boutique that sold out for October and November – in four days – and already has a waiting list for December (watch the band’s Facebook for future dates)! The band’s lineup for Saturday will feature David Dennis on saxophone, Kabaka Ashe on keyboard, Jerry Powell on drums (Powell leads his own group at The Savoy Friday), Charles Smalls on auxiliary keys, Jason Waters on bass, and special guest Najoura on vocals. Columbus vocalist Najoura attended Berklee College of Music, and Dennis tells me that she has a “very versatile voice [that’s] smooth and clear as a bell.” If that’s not enough, he also tells me that the band will be performing some new tunes! Tickets are $5 in advance here or $10 at the door, so make your plans now for a soulful Saturday night out! The JazzPoetry Ensemble (Michael Vander Does, Roger Hines, Roger Myers, Brett Burleson) and special guest Mark Donavan on baritone sax will perform compositions by Bluiett, pieces he inspired, and pieces they performed together. They will be joined by various Columbus musicians whose lives were touched by Bluiett. Leader Michael Vander Does will perform his poetry and a new poem about Bluiett by his good friend alto saxophonist Oliver Lake. 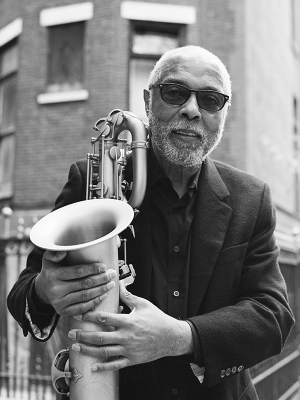 Oliver collaborated with Bluiett for over 40 years from their time together coming up in St. Louis through their last performances together in Columbus in 2016 and a World Saxophone Quartet performance the next week at Pittsburgh’s City of Asylum. I really enjoyed hearing Donavan on baritone sax recently, so he should be a great addition to the band for Sunday. There is no cover, but donations are appreciated. While I’m sure many venues and events will be in the spirit, there are a few different shows that will focus on celebrating Halloween with jazz in the coming week. On Saturday, October 27th starting at 9pm, Holla-Ween Weekend at The Shrunken Head will feature Athens’ Largemouth Brass Band (more details here). A diverse lineup of Halloween week events at Natalie’s includes a Halloween Show with Toxic Euphoria on Sunday, October 28th at 8pm. This new trio features Tony McClung (percussion) and Jeff Ciampa (bass) from Birdshack, along with longtime collaborator Jim Ed Cobbs (keyboards, percussion), “performing electronic music in a fresh and unique way” (tickets and info here). Your best bet for holiday spirit on Halloween proper is Jazz Wednesday Halloween Edition w/ Liver Quiver (and friends!) at Brothers Drake on Wednesday, October 31st at 8pm. This free event finds Liver Quiver reunited onstage with guitarist Aaron Quinn in from NYC to join Alex Burgoyne and Seth Daily, and promises “a night of spooky improvised music, silent film, and special guests (loads of surprises! )” (more details here). Happy Halloween!